2017 was a year of sickness for Ramesh. It began with regular bouts of diarrhea. By the middle of the year, Ramesh and his mother were desperate to find out what was causing it. The answer was not one anyone would like to hear – Ramesh was diagnosed with HIV infection. His CD4 count, (which usually ranges from 500 to 1500) was just 42, well below the 200 that indicates advanced HIV and prompts an AIDS diagnosis. Shortly afterward, he was diagnosed with abdominal TB, which along with the constant vomiting and diarrhea, left the 28-year-old weighing just 55 pounds. This was not the first year marked with tragedy for Ramesh. At 12 years old he was learning to ride a scooter. A group of nearby children were playing a game by the side of the road. Resting a stick across a rock, they would strike the raised end with all their might and watch the stick spin through the air. As Ramesh rode past them, the catapulted stick struck his eye. As a result of this, Ramesh forever lost his sight in that eye. Like the rest of his family, Ramesh never went to school. From an early age he began contributing what he could to the family’s income. One day a week, he and his brothers sold what he could – vegetables, wedding cards, or decorative items for houses. For the rest of the week he did the physically exhausting work of stripping the plastic insulation off electrical wires. From an equally early age, he also started using drugs – first those he could inhale and smoke, and later those he injected. His mother recalls the many tears she cried when he’d disappear for a week or two at a time. Tragedy struck his life again when he was a young man of twenty. Ramesh and his brothers were out selling vegetables. Their alcoholic father, who was at home drinking on the terrace, fell and died on impact. While Ramesh’s story is one of tragedy, it is also one of hope and determination. One night toward the end of the year, Ramesh became very sick with diarrhea. He was severely dehydrated – to the point that he had no detectable pulse and his blood pressure could not be measured – but he made the nearly three-hour journey to Shalom alone, knowing he would find someone there willing and able to help him. For most of the journey he took local public transportation, but at one point a man riding a scooter recognized he needed help and took him part of the way. In all, he changed vehicles four times. The Shalom staff want him to live too. They are committed to provide compassionate care and to do whatever they can to make his life dignified and as comfortable as possible. I speak on behalf of people living with HIV. Each one has immense value and we have a responsibility to care for their needs. At Shalom we see the need on a daily basis. We see the terrible impact that HIV has on people living in poverty. We see the pain and suffering every day – and it breaks our heart. It is this that moves our team to serve them, so that they and their families can experience healing and hope. However, we are finding it more and more difficult to raise funds for the work we do. This is because of a general perception that HIV is no longer a problem. But that's not true – there still are many people in Delhi with advanced HIV, and they need help. We are the only Care Home left in Delhi that provides medical services for people with HIV. It is important that this work continues so that people living with HIV in poverty can receive care with dignity and love. I would like to challenge you to consider standing by us at this time and making a donation, even a small one, for this work to continue. We believe many donations can pool together to meet the need. Your donation can make a difference, and we urge you to do so. Donations can be made on EHA USA's donation page or you can contact us at savita.duomai@eha-health.org. We want to stand in solidarity with each person living with HIV. Each one is important. Each one's life matters. Each one has much value. Would you join with us in this cause? EHA's Shalom Project in Delhi serves some of the most forgotten people in India -- those affected by HIV/AIDS. Often women are infected by their husbands and then left to fend for themselves. The children sometimes find themselves infected too, through no fault of their own. The wake that this disease leaves behind is overwhelming. The newest program to come from Shalom Delhi is the Kiran Project. Kiran means "ray" in Hindi. Seeking to provide a ray of hope for widowed and abandoned mothers with HIV/AIDS, cancer, or other disabilities, the Kiran Project was started to give a means of livelihood to these women so they can provide for their families. The women sew hand-tailored bags, pouches, trivets, coasters, and crocheted handicrafts. Each handcrafted item adds a thread of hope to the lives of these artisans. Shalom also initiated the Kiran Project to decrease the sense of shame and helplessness that accompanies life-limiting illness. In addition to employment, Kiran artisans are provided a safe place to come during the day, access to medical care and counseling, and a community of similarly-affected people. "The Kiran Project has given me hope for the future. I can now move past my fear for tomorrow," one participant shared. 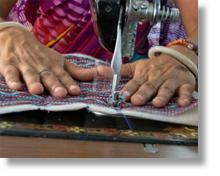 The artisans who are a part of the Kiran Project come from the lowest sectors of society. Either the artisan or someone in their immediate family is infected with HIV or cancer, thus limiting the future of the family. Through the Kiran Project, the workers have been able to provide food for their families and school fees for their children, while the community among the artisans has decreased their sense of stigma and increased their feeling of empowerment. Because of this work, their children have food to eat. Kiran trains its workers to make textiles because this work is manageable for those faced with illness, and gives space for the artisans to allow their creativity to flourish. For those who are too weak to come to the center, primarily cancer patients and those with disabilities, the Kiran Project initiated a home-based sector, training homebound women to make crocheted products. Thus, their crocheted items are often made by their most vulnerable patients. Feel free to visit the Kiran Project's website to see more about what they are doing to help these women, and soon, to shop for their handmade products directly online. In India alone, there are an estimated 200,000 children living with HIV. Seema is one of them. Yet Seema not only has HIV, she also is one of the rare individuals to be diagnosed with CMV Retinitis, which causes permanent blindness. Her story is one of pain, struggle, and hope -- a gifted learner trapped within the unimaginable constraints of living with HIV and irreversible blindness. At the young age of eighteen, she has suffered more than most of us do in a lifetime. 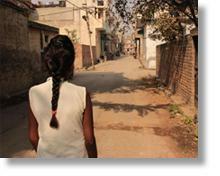 Seema's family lives in a one-room home in a slum area of Delhi. Since the age of five, she has suffered from frequent illnesses. While she has an older brother and a younger sister, Seema is the only one who is HIV positive in her family. Sometime between sixth and eighth grade, she began to lose her eyesight, and by the time she was in tenth grade it had deteriorated considerably. Her family took her to an ophthalmologist who made a diagnosis of CMV Retinitis. He referred her for an HIV test which came back positive. Slowly the truth dawned on Seema: not only was she losing her eyesight, she was also HIV positive. "I felt so devastated about my condition. I was so sick and weak. My brother had to carry me," Seema reflected. In Seema's words, the last five years have been "really terrible". After she was diagnosed with CMV Retinitis, her teacher told her, "Drop out of school, and return when your eyesight is better." The day that her eyesight has returned has still not come. She has not been able to study, suffered from numerous problems, often gotten upset, reduced her eating, been discriminated against for her HIV status, and has constantly worried about the future. Being blind and distant from vocational or educational pursuits, she wonders if there is a point to living. "I don't find hope in anything at the moment. I am a burden on my family, so I feel that it's better if I die," she shared. Seema sees education as a means by which she can regain her life; her goal is to finish 12th grade. She feels that at least studying through 12th grade would provide her an opportunity to maintain a decent job. In reality, an education would mean more than that: an education would build her confidence and give her hope and a reason to live. Seema has been a part of Shalom's Life Skills Program for young people affected by HIV. She has made friends with other HIV-positive young adults, and they reach out to her; they understand where she's coming from. Shalom is exploring opportunities for Seema to be able to study again and fulfill her dream of completing 12th grade. If you would like to make a donation to help Seema reach her dream, visit our website and choose "Shalom Project in Delhi" from the menu. The Shalom Project steps in to provide hope, medical care, medicine, livelihood training, and programs for children and adolescents, including life-skills training, character development, and group counseling. Read on for Anil's story. 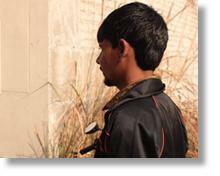 24-year-old Anil has lived the majority of his life between drug addiction and rehab facilities. From the age of nine, when he was first influenced by a group of older boys around his home in West Delhi, Anil left school and has been trapped by addiction, using and experimenting with whatever substances he was able to access through his peers: various forms of marijuana, glue, and likely heroin. Injection Drug Use (IDU) is a common pathway by which people become infected with HIV. For the last fifteen years, Anil claims that he has been in and out of "at least six rehab centers," one of which he was in "at least twenty times." He first came to Shalom eleven years ago at the age of 13, soon after he was first diagnosed as HIV-positive. Anil's family is remarkably supportive and wants him to make a life for himself. More than ever, Anil is willing to work. "There were many times where I would run away from home, but my mother never gave up looking for me, and she'd find me and take me to rehab facilities," he said. Even his siblings motivate and encourage him. Anil was recently diagnosed with Tuberculosis (TB) lymphadenitis, and he was in Shalom's facility receiving Tuberculosis treatment (CAT II) -- a treatment that requires 24 daily injections. While patients often receive these injections outside of Shalom, his mother wanted him to finish all 24 injections at Shalom as she was afraid that he would not complete the treatment at home or in a rehab center. "I very much like Shalom," commented Anil. "Here, they provide services for all of your needs: food, drink, everything. And you can ask them questions anytime. Normally, you'd only get that kind of care in private hospitals. Yet there, the costs are so high that my family would not be able to afford them. You know they care about your interests and wishes here at Shalom." "I haven't always thought I wanted to leave drugs. In between times of using, I just thought I'd die. But now, I want to quit drugs. For my family. For my mom. And for my siblings. I want to quit because I see my family's care for me." When speaking with Anil, it is hard not to see the care he has for others -- and his desire to live an ordinary life. Shalom plans to refer him to a good rehab center after he is discharged, and then follow up on him. Staff at Shalom are looking into ways that they can better support Anil over the next few years in coping with his life with HIV and assist him as he seeks to come out of drug addiction and begin working in a stable environment. Alone, an HIV diagnosis is a massive challenge, but paired with a disability such as cerebral palsy, it becomes almost unbearable. Yet Prince, a boy diagnosed with both CP and HIV, manages to keep a joyous smile. Shalom first met Prince's family six years ago, when his mother was admitted with complications from HIV. She died at home later that year. Also HIV positive, Prince's father struggles to face each day. He was the first in the family to contract HIV, passing it on to his wife. Prince, his eldest son, was born positive. The difficulties of raising a disabled son and losing his wife drove Prince's father into a deep depression. His family tried to help as much as they could. His siblings visited frequently, offering to help with Prince's needs, encouraging his father to work and raise his children well. Yet the depression was too much. Prince's father refused all assistance, worked irregularly, and did not care for the children. Prince's younger brother was taken in by his aunt, and he now lives in the village, attends school, and engages in family life. But Prince, bound by the difficulties of cerebral palsy and HIV, is too much responsibility for any relative. So he remains at home with his father, spending his days sleeping and watching TV. Over the years, Prince has become impressively self-sustaining. He feeds himself, and on the days when his father works, is able to pull himself to the bathroom. But he dreams of so much more. When asked by the Shalom team what his greatest desire was, Prince said he longed to be outside, to feel the sun and see the world beyond his room. But limited by his body, Prince's world remains small and isolated. Prince's father refuses home visits from the Shalom palliative care team; he neglects to take his son for antiretroviral medications, and fails to take the food rations offered by Shalom. Despite innumerable conversations, attitude change seems impossible. Yet, we at Shalom cannot let go of Prince. We are hoping to find other ways to improve Prince's quality of life. Because of his double challenge, limited by both HIV and CP, Prince cannot be taken into a hostel. So Shalom is seeking other avenues. Hopefully, Prince can be brought out of his home by volunteers and taken to Sunday school or Shalom's adolescent program, giving him the opportunity to interact with other children and see the world outside his window. Perhaps someday Prince might access education by a home tutor. Over time, we dream of full restoration for both Prince and his father, so that they may be able to look to the future with hope and expectation. EHA has several projects that support people with HIV. The Shalom Delhi Project is one of the oldest and largest. Recently Dr. Savita Duomai, Project Director, was interviewed on WBEZ, a public radio station in Chicago. The following is a summary of her interview. What does the Shalom Delhi Project do? "India is home to the third largest HIV population in the world. The numbers are overwhelming. Shalom is a center that cares for people with HIV, and we've been ministering for 15 years. Our goal is to improve people's quality of life, support them, and enable them to live satisfying lives. Most people in Delhi with HIV are desperately poor, and many are migrants from neighboring states. Once people get HIV, it complicates their situation significantly, and it quickly becomes dire. The government does provide HRT medication free of charge to treat HIV, but there is a lot more to caring for people with HIV than just giving medicine. At Shalom, we strive to provide comprehensive, holistic, quality care." What people groups do you reach out to? "A lot of the families we care for are headed by widows. Being a widow is bad in India, but being a widow with HIV is devastating. Women already have less status in India, and then if they become widows they lose their inheritance and family support. They are isolated from the community, sick and less able to work, and yet they have children to care for. We walk with these families and support them. Sometimes the children are affected as well as the mothers. We help them cope with the situation, live through it, and raise their children. We have set up a community center for women with HIV to be a part of support groups. These women work together to make products to sell to support their families. This helps them meet practical needs. Another group we reach out to is transgenders. They are marginalized in society as much as you can be. There are about 50,000 transgenders in Delhi, and it is estimated that 25% of them have HIV. We have to reach out to them; they do not come to us. We have built relationships with them and they trust us." What facilities and staff do you have? "Our health center has ten beds as well as doctors and nurses. Patients know that anytime they get sick, they can walk into Shalom and get good care. We also have a home-based program with staff who ensure patients are taking their medicine, who give emotional support, and who encourage them. We regularly visit about 100 families each month. There are also volunteers from local churches who connect to families and build relationships. We have an adolescent program to teach character and life skills. Shalom serves about 400 people each month between our center, our home-based care, and our other programs. All of us on staff want to care for these struggling people and help them see that they have value. We communicate this care through our actions, our words, our relationships, and who we are. We offer to pray with families, and we've never had anyone refuse. We strive to see them through God's eyes, see what they can become, and allow God to move through us. It's not about us, but about God working through us to reach them. We are thankful to be a part of what God is doing." What do HIV patients struggle with the most? "People with HIV need support but there is such a stigma to having HIV both from others and from within. These people have low self esteem and often believe they are cursed. We work to restore their sense of value by telling them they are made in the image of God and that He loves them. HIV is a medical illness, but the social impact of it is also important. If we want to improve their quality of life, we have to address those social issues and help them be less isolated." What do you want EHA supporters in the USA to know? 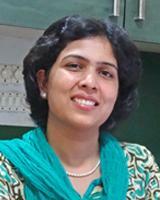 "People often think that the number of people with HIV is decreasing in India and it's time to move on to other issues. While some areas are seeing lower numbers, the occurrence in North India is rising. We at Shalom face the consequences of this thinking -- we see the people struggle. HIV is still causing unimaginable suffering in poverty-stricken people. If we were to move away from this situation, they would be crushed. In the future, we hope to grow our program and open more centers so that we can help more people who are struggling with HIV to be able to live their lives to the fullest God can give them."